Welcome to a new feature of The Fashion Historian! One of my favorite things to do, and one of my favorite research topics, is finding historic influences in modern haute couture. So every so often I'll put up a picture of couture next to a period image. No lengthy explanations about what the influence is or why it was chosen or the social relevance, I'll just let the images speak for themselves and let you enjoy some beautiful creations. 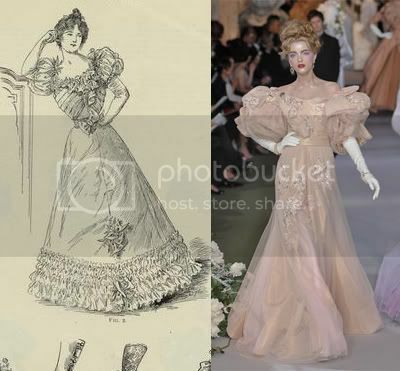 Left: Fashion plate from 1897, taken from the New York Public Library Digital Gallery. Right: Dior Fall 2007 haute couture, designed by John Galliano.